You have TWO WEEKS to play along - Deadline to enter is Friday, February 22 , 2018 at Midnight CST. The winners will be announced on the NND blog the following Monday. 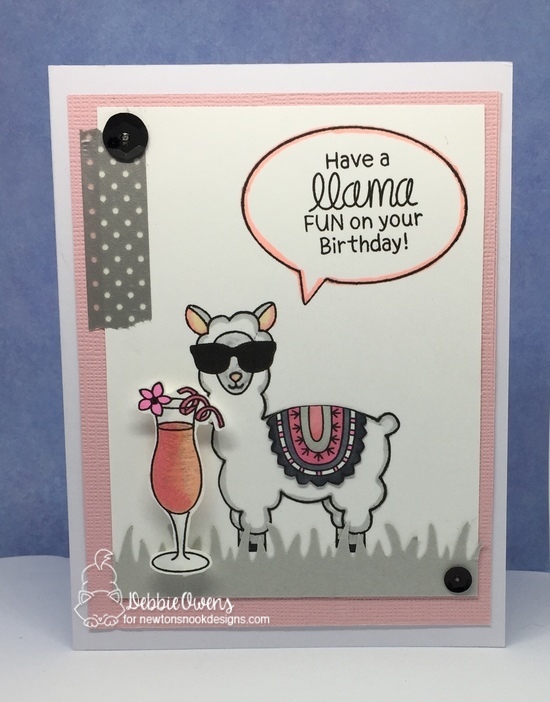 Those cool sunglasses on the llama makes Debbie Owens card delightful! She starts with pink and white layers. She stamps the sweet llama from the Loveable Llamas stamp set and uses the challenge colors on the blanket. She then adds a yummy cocktail from the Cocktail Mixer stamp set, and adds a speech bubble from the Newton's Day Dream stamp set to showcase the sentiment. She adds a bit of washi tape and sequins to finish it off. Diane Morales creates an oval shaped card with scalloped edges. 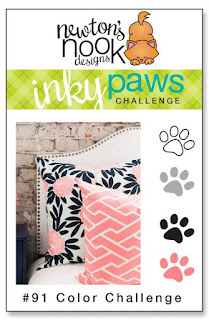 She uses the Argyle stencil to create the background using pink, white and gray. She adds the banner from Frame & Flags die set and stamps the sentiment. The focal point of her card is the girl holding the big bouquet of balloons from the Holding Happiness stamp set. The added hearts on the balloons are a perfect touch! Who knew a shark could look so sweet! 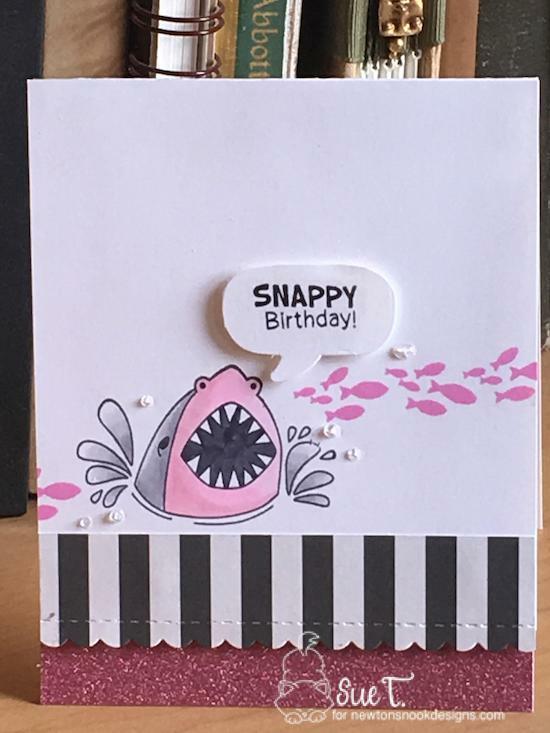 Sue T. obviously did with this fabulous gray and pink shark from the Shark Bites stamp set! She adds a school of pink fish and a popped-up speech bubble. For sparkle, she adds pink glitter paper and a stripe of white and black pattern paper that she partially die cuts with the Frames & Flags die set to give it a scalloped edge. Becky Noelle's card definitely has love in the air! She starts her card by lightly distressing th!e background using the Tumbling Hearts stencil. She adds the Eiffel Tower from the Newton Dreams of Paris stamp set and sentiment from the Uplifting Wishes stamp set. She creates the ground using gray card stock and the Land Borders die. She adds two feline images from the Newton Dreams of Paris that she colors wonderfully! 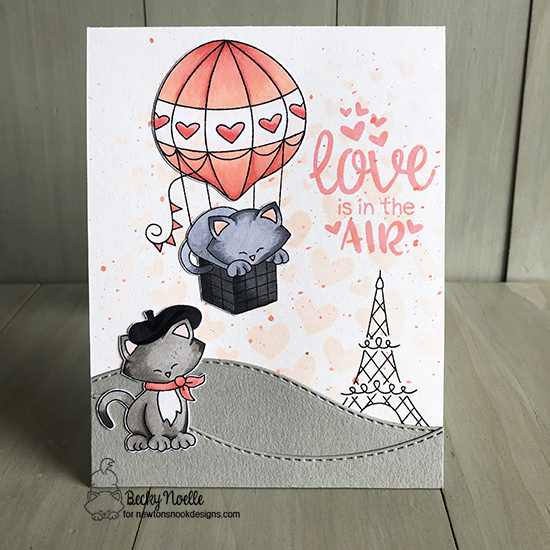 Bobbi Lemanski begins this sweet card by distressing the bubbles from the Bubbly stencil in a darker shade of pink than her card base. She them adds a strip of black and white washi tape. She adds clouds from the Raccoon Rascals stamp set. Her focal point is the pair of gray owls from the Love Owl-ways stamp and die set. She adheres a pink and red heart banner from the branch. Cute!